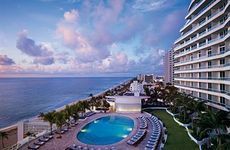 Find The Ritz-Carlton, Fort Lauderdale deals, discounts and special offers. Set on the waterfront, this resort features soft beaches, a beachfront restaurant, an outdoor pool and a spa . This elegant, Old World hotel in the heart of downtown prides itself on its hospitality and service. This resort, located next to the Inverrary Country Club, features a restaurant, spa, outdoor pool and fitness center. Enjoy a cooked-to-order breakfast each morning and a manager's reception in the Atrium each evening. Catch the Water Taxi at the back door of this hotel situated on the main Intracoastal Waterway in Fort Lauderdale. This beachfront hotel offers 225 well-appointed guest rooms, including 15 oceanfront suites, with open-air balconies. Located on 350 feet of beachfront, this resort offers snorkeling and diving trips to natural coral reefs near its beach. Just two miles from the airport, this hotel offers a complimentary continental breakfast and outdoor pool and hot tub. Near downtown Fort Lauderdale, this hotel offers a complimentary full breakfast and outdoor pool. Located on Fort Lauderdale's North Beach, this hotel offers beach cabanas and a sunrise terrace with infinity pool. Set in the center of Florida's Gold Coast, this hotel overlooks the white sand beaches of the Atlantic. Set on Fort Lauderdale's beach strip, the Sea Club Resort offers complimentary use of beach chairs and towels. Ramada Plaza Fort Lauderdale features complimentary parking, an outdoor pool with tiki bar and complimentary breakfast.